Put on your headphones, sit back, and prepare to watch one of the trippiest math-related videos you’ll ever see. Created by French dub techno musician and fractal artist Alexandre Lehmann (who also goes by Ricardo Montalban or Zzzzra), “Overstepping Artifacts” is a truly bizarre journey. It takes the viewer through an otherworldly landscape that is part geometry, part biology, part steampunk architecture, and all very mesmerizing to watch. 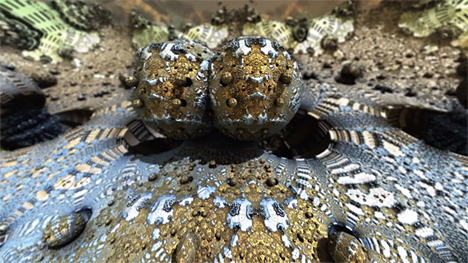 The short video was created using fractal-creating software that accompanies Lehmann’s own music. 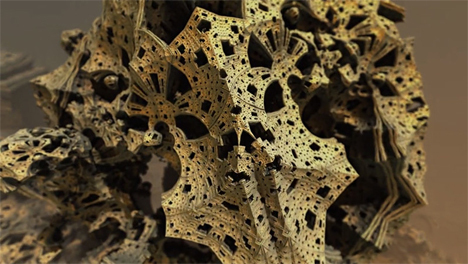 The fractal shapes shift and change as though alive, constantly taking on new shapes. At times they seem alive. At other times, they seem like hostile parts of alien worlds. The Overstepping Artifacts video is part of Lehmann’s ongoing Musicians with Guns series. Music is his main passion; 3D fractal art is a tangential interest but happens to dovetail nicely with the unique sounds of his original music pieces when they are played together. You can check out more of his work on his SoundCloud page. See more in Digital Design or under Technology. June, 2014.